Looking for a way to keep your child entertained during your flight? Our Kids app is now available for download. This innovative app is sure to bring out your child’s creative side! Using a phone or tablet, your child can color a picture and bring the image to life in 3D. To use our new app on your next flight, simply download it before departure (80 Mb). 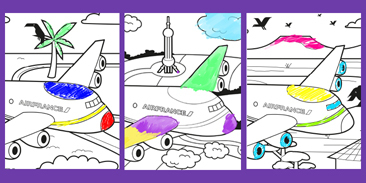 On intercontinental flights, your child also receives a free set of games that includes a postcard to color. Over the course of his or her travels, your child can collect 3 different drawings. focus on different parts of the picture to win collectible cards. After winning all the collectible cards, your child can unlock the print feature on the app. Simply print the drawing and play again! And if you send the postcard to a friend or family member, they can also display the drawing in 3D upon downloading the app. Download now! Your child can start enjoying the Kids app today.